These guys are one of the greatest Traditional Doom Metal bands of all time. Epicus Doomicus Metallicus, Ancient Dreams and Candlemass are my favorite. They've been one of my favorite Trad. Doom's since I got into Doom, but lately, I've been putting them aside for a lot of other bands. I like pretty anything they've put out, although some albums did lack. I love nightfall... "Gothic stone" on that album is great tbh. Dude, I can not wait. DO IT NOW! It's great. One of my favorites by them probably. What? No Tales Of Creation? It's probably my 6th favorite by them. Only album I don't care for is VI I like them all. 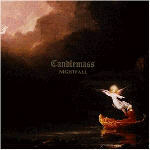 I like all the Candlemass albums but Tales... stands out the most for me. One of the greatest doom metal bands there is. "Epicus Domicus Metallicus" must be THE most classical doom metal album ever. big fan, such a great band. Yeah they are pretty consistent. I was more like "What? No King of the Grey Islands?!" I know Messiah is a great singer, but I prefer Rob anytime over him. I've gotten to where I like Rob more aswell. I actually already heard quite few people saying exactly this. Though they were in the beginning a bit sceptical about how Rob would fit into Candlemass after such a charismatic singer as Messiah was. I´m Rob Lowe "fangirl", I love his vocals, so it´s not surprising that I like Solitude Aeternus too, right? Yeah I prefer Rob by a long shot, its just that Tales is so much more musically. So I loved Candlemass and Epicus Doomicus Metallicus so is it a given that I'll also love Death Magic Doom? Maybe not, Death Magic Doom reminds me more of Sabbath than any other Candlemass album. You'll probably like it, but I can't say for certain. It's a very solid album though. I highly suggest it for you, being you're a Candlemass fan.